On a hazy August morning in Manhattan, Antonio Castro leans over the railing of a hotel balcony to point out a couple softball fields in Central Park below. He's in New York as a promoter of a cause. But unlike his famous father, former Cuban president Fidel Castro, whose rare, carefully screened, highly touted and tracked visits to New York for diplomatic events made headlines, Antonio -- or "Tony" as he prefers to be called -- comes without fanfare. People who've gotten to know him say he shuns the spotlight and avoids the politics so associated with the Castro name, a name tied to the U.S.-imposed embargo against Cuba that has restricted travel and trade for over 50 years. That Antonio Castro comes to New York at all, and agrees to talk to a reporter, is evidence he is embracing a more public role. Ready to be an ambassador. All in the name of baseball. In the past several months, Castro has been traveling -- Russia, Japan, England and the United States -- to gain support for returning baseball to the Olympics, after the International Olympic Committee spiked the sport following a 16-year-run. The decision was especially hard to Cuba, which had won more medals in baseball, including three golds, than any country since the sport's 1992 Olympic debut. "The Olympic dream is the most important for the athletes," he said. "Every tournament that you win is important, but the Olympic tournament, if you are the Olympic champion, it is the top title." Castro, who played baseball and soccer in college, went on to study medicine and became an orthopedic surgeon and now serves as the medical director for the Cuban Olympic delegation. He's a vice president with the International Baseball Federation (IBAF) and representative of the newly formed World Baseball Softball Confederation, an IBAF subset leading the Olympic return effort. "In September, we continue to fight for the dreams of the boys and girls. Dreams. And we think positive," he said. The IOC is scheduled to vote Sept. 8 on which sport -- a joint bid of baseball and softball, wrestling or squash -- gets added to the Olympic program starting in 2020. In his early 40s, Castro is a young face for advocacy, representing a country with an obvious stake in the IOC's decision. And as much as he might want to downplay his political ties, having him as the ambassador for baseball and softball's bid speaks to how the sports can cross boundaries between nations politically at odds -- a main tenant of the altruism behind the Olympics. His friendship with Team USA executive director Paul Seiler also led to the Cuba national team coming to the U.S. in July for a friendly series against the Americans, the first meeting between the teams in 17 years. "It's a powerful recognition. Good, bad or indifferent, it's a powerful recognition," said Seiler of Castro. "To have him as part of our team to try to convince the IOC that this is important, he's a powerful, powerful recognizable advocate. We're lucky to have him." 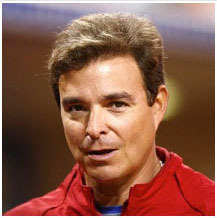 But Seiler, another leader in the Olympic bid, and Castro are aware that they need to balance their countries' interest in the Games with speculation that the IOC, especially its European leaders, kicked baseball out because of a belief its popularity was too concentrated in the Western Hemisphere and just a few countries in Asia. But Castro said that has changed in the past few years and there is evidence of global growth in baseball and softball, which now accounts for 65 million athletes in more than 140 countries, according to the IBAF. "I was there for the 2012 Olympic Games [in London]. I worked with the Cuban delegation and all of us missed our athletes, our baseball athletes. Inside the delegation, we did not feel good," Castro said. But during a trip this May to London, he said he felt a "lot of energy" among baseball and softball supporters there and noted the recent opening of a major new complex near London that has been designated as the home of youth baseball and softball in Britain. He also pointed out that the Netherlands won the 2011 World Cup and ousted Cuba in this year's World Baseball Classic (the Dominican Republic won the international tournament). Softball is also expanding, he said, into the Muslim world where there are softball leagues sprouting up in the Middle East. Baseball's outreach, and eventual merger, with softball could be seen as an obvious tactical move to improve both sports' bid to return to the Olympics, as the IOC has tried to increase the overall number of female athletes at the event (London marked the first Olympics where every country had at least one female athlete compete in the Games). "I've heard the term it's a 'marriage of convenience.' I think it's a marriage of intelligence. It's a smart combination of two different sports," Seiler said. Seiler and Castro emphasize how they've packaged both sports in their Olympic bid, squeezing the tournament schedule into 12 days -- six for baseball, six for softball -- with eight teams in each sport playing a round-robin format. "In essence, you can have baseball come in, play in the venue, walk in the opening ceremonies, be there for about seven or eight days. And as baseball's walking out of the [Olympic] village, softball's walking in," Seiler said. "In that time, the field is being transferred from a baseball venue to a softball venue." Another challenge not so easily managed is the continued resistance of Major League Baseball to suspend its season to allow professional players to compete in the Olympics, a stance that commissioner Bud Selig recently reaffirmed. Castro, who caught a Yankees game during his recent visit to New York, is careful in addressing the issue. "We have a very good relationship with Major League Baseball. We work with them very closely, together, and not only Major League Baseball, but with all the professional leagues. They fully support our campaign," he said. He says IOC members are well aware of the situation. Baseball and softball supporters are addressing it for now by saying they are confident they'll be able to work something out with MLB by the 2020 Games. With Selig planning to retire at the end of the 2014 season, it is unknown what stance a new commissioner might take. "We don't see this as a problem for us," Castro said of the MLB conflict. "We have a long time to find a solution. We have seven years."